Dealer pricing may include incentives. The Kelley Blue Book(r) Fair Market Range does not factor in consumer rebates and incentives. 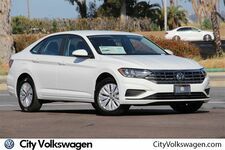 Tornado Red 2019 Volkswagen Jetta 1.4T S FWD 8-Speed Automatic with Tiptronic 1.4L TSI Titan Black. I went to 2 other dealerships and Christa at City VW was the only one who knew how to order a GTI with the Performance Package. The Performance Package was a new option back in December of 2014 and other dealers had no idea how to order that for my build. I made my build with her in Decemeber 2014 and got my car in April 2015. I'm so glad I waited and got the build I wanted. City VW was top notch. I needed 3 test drives to decide which Jetta I wanted and Christa De La Torre didn't balk for a moment. She had all the info I needed to make my decision and the Sales Manager, Tony broke down all the numbers for me. Overall great experience. Christa de la Torre was great! Very professional, not pushy, very helpful and full of helpful information. She tracked down the Golf Sport Wagon we wanted, traveled across county to get it from another dealer, and had it ready to go in less than a day. Great attitude and good price make us very happy we went to City VW instead of the others, esp Kearny Mesa VW which did not seem to care about our interest. Ana was tremendous and very helpful in spending the time to find the specific model, trim and options I wanted along with color. After some deep searching, they were able to find my car and get it within days. Vehicle arrived in excellent condition and all features of the vehicle were explained in thorough detail. I was very hesitant, not at all sure of what I wanted exactly, and Christa was super patient and attentive. I highly recommend her and everyone at City. They're friendly without being pushy.